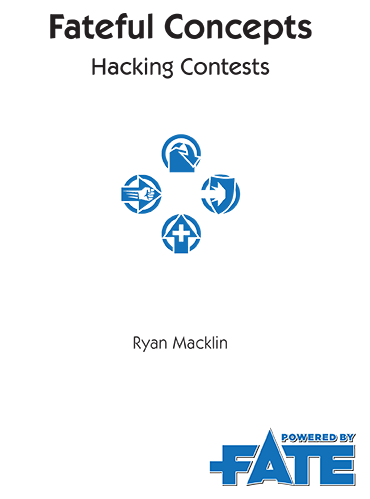 Fateful Concepts: Hacking Contests is a collection of five articles about understanding and changing the contest system in Fate Core and Fate Accelerated. There’s more to contests that you might think. The inherent pacing of victories and sense of passive competition can surprise you the first few times you use contests. Understanding how to tweak these dials won’t just help you run normal contests—it’ll help you hack Fate in general. Contests assume that there’s one finish line, and uses ties as a way to shift the situation. But what if you’re not just competing against each other? What if there’s some creeping factor that will make everyone lose if no one triumphs quickly enough? Adding a time element to your contests can shift the tone and tempo of scenes in fascinating ways. The chase system in the Fate System Toolkit uses conflicts to handle chases. Here’s another way to handle chases that shows how to hack contests for direct competition rather than a race to a single finish line. The base contest rules state that a conflict breaking out stops the contest, but that doesn’t have to be! There are plenty of stories where characters are trying to achieve something while under fire, and this system gives you exactly that: blending contests and conflicts together into one action scene. What if you build to a climatic scene with several directions for action beyond just conflict? This article has you covered by showing you how to have multiple objectives in a scene by splitting them into multiple, side-by-side contests. Pair with contests under fire for something truly explosive! Pair this with Fateful Concepts: Character Aspects to broaden your Fate horizons! This title was added to our catalog on January 26, 2015.